Learn about Arenal’s History while Paddling Across Costa Rica's Biggest Lake! You’ll love kayaking Lake Arenal! 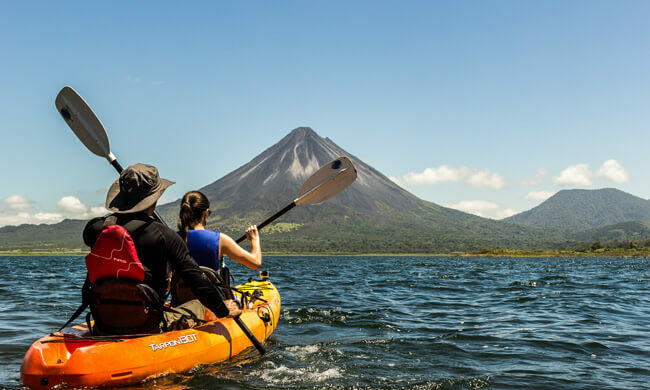 Paddle through the largest and most important lake in Costa Rica, right in front of the impressive Arenal Volcano! This two-hour tour takes place on Lake Arenal and is ideal for both beginner and advanced kayakers. Enjoy the stunning backdrop of Costa Rica’s most iconic volcano while accompanied by an expert naturalist and kayaker. You’ll be able to observe aquatic birds while you learn about the region’s culture: hear stories about wildlife like jaguars and tapirs in the surrounding rainforest, the days in which Arenal Volcano was considered extinct, and why it has become Costa Rica’s most visited natural attraction. Relax in the sunshine as you paddle with a friend in a tandem or in your very own kayak. After your time out in the water, enjoy fresh fruit on the lake shore. There’s a shower and changing room available. Then, you’ll be taken back to your hotel. Restrictions: Minimum height of 4 feet tall. Included: Transportation, equipment, bilingual guide, showers, towel, water, fruit.